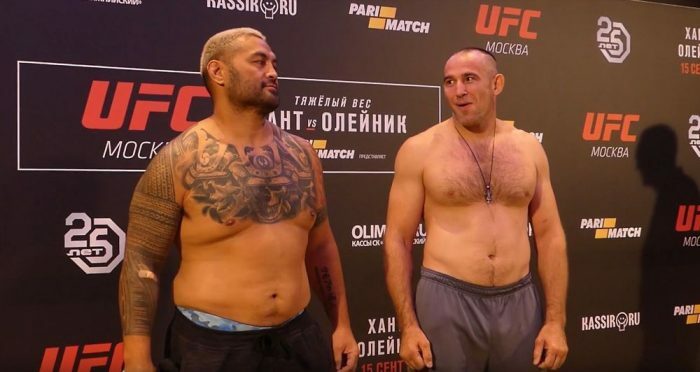 Two fighters missed weight this morning at the UFC Moscow weigh-ins but all fights will take place tomorrow at the Moscow Olympic Stadium. Both Mairbek Taisumov and Jin Soo Son missed weight this morning at the UFC Moscow official weigh-ins, but thankfully both will still fight tomorrow night in Russia. Taisumov, who hasn’t fought since UFC Rotterdam when he defeated Felipe Silva via first round KO, came in 5-pounds over the UFC Lightweight limit after tipping the scales at 161-pounds. UFC officials later announced that he would be docked 40% of his fight purse and that his fight with Desmond Green would still take place tomorrow evening. Son, who will be making his UFC debut on Saturday, came in 1-pound over the UFC bantamweight limit after weighing in at 137-pounds at the Hilton in Moscow this morning. UFC officials announced that Son will be deducted 20% of his fight purse and his fight with Petr Yan will start take place tomorrow. All other fighters made weight successfully. You can see the full replay of the weigh-ins below and the face offs.